Our fashion series is made of durable, acid-free polypropylene. Our Fashion Series is made of durable, acid-free polypropylene. 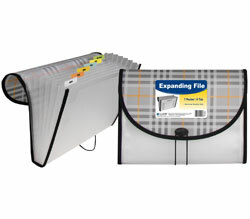 Includes preprinted tab inserts, black stitched edges and button and elastic closure. 13-pocket coupon size. Black and gray circle design.